Audubon membership is a terrific three-fer deal! 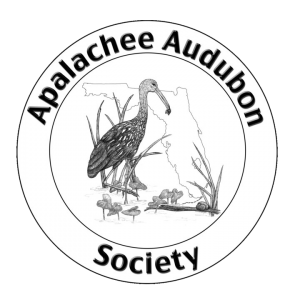 Join National Audubon and you automatically get a membership in Audubon Florida and the Apalachee Audubon Society (if you live in the area our chapter covers). Join National Audubon now and your first year’s dues will go to Apalachee Audubon. If you are a student, please see student discount below. Members receive the award-winnning bi-monthly Audubon magazine, free membership in the local Audubon Chapter, opportunities to visit most sanctuaries and nature centers, invitations to study with Audubon experts at ecology camps and workshops, and eligibility to participate in wide-ranging Audubon trips. You can also pay for membership using a credit card by calling Audubon’s toll free customer service number, 1-844-428-3826. (Please mention our chapter ID, E19, for AAS to get full credit for a new membership). Paying by check? Please read below. DO NOT send your check to National Audubon. If you are a student, our membership fee is 5$. Please send check or cash to above address or bring to a program meeting.